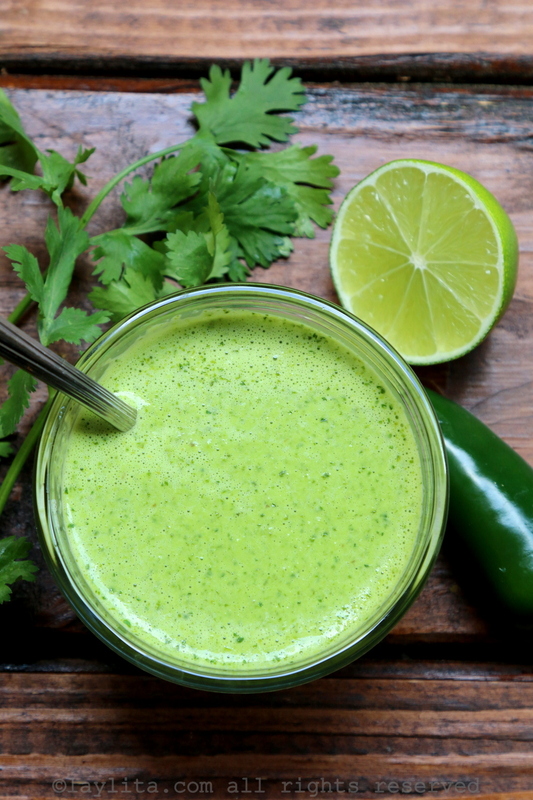 This recipe for a warm lime cilantro butter sauce is perfect to serve with fish and seafood dishes. The spicy tangy creamy sauce is made with garlic, shallots, white wine, limes, cream, serrano chile peppers, butter, and cilantro. This recipe was adapted from the cookbook Fired Up, by Jeff Blank from the restaurant Hudson’s on the Bend – one of my favorite places when we lived in Austin. 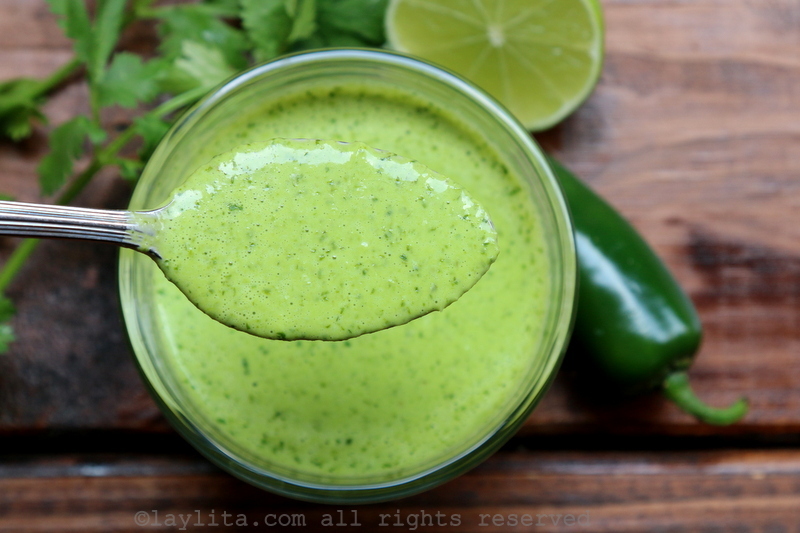 Recipe for a warm lime cilantro butter sauce – made with shallot, garlic, white wine, limes, cream, spicy peppers, butter, and cilantro. This spicy tangy sauce is perfect to serve with fish and seafood dishes. Combine the shallot and garlic cloves in a mini food processor and pulse until well minced. Bring the white wine to a boil in a small saucepan over medium heat and reduce to half the amount. Add the minced shallots and garlic, the lime juice, lime zest and cream to the reduced wine. Continue cooking until reduced by half again, about 10 minutes, and remove from the heat. 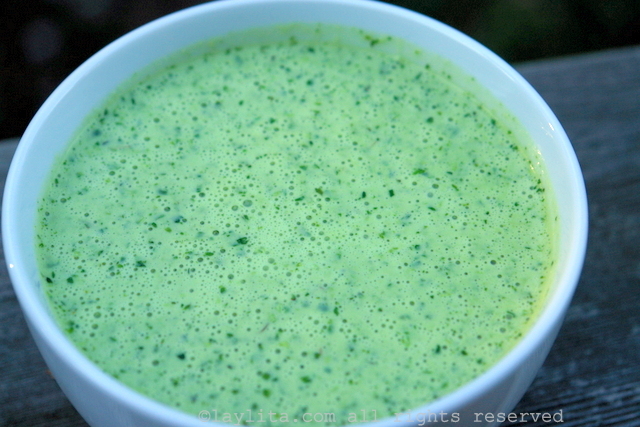 Blend the warm sauce mix with the Serrano peppers; include the seeds and membranes if you want it extra spicy. Add the butter, piece by piece, and blend well. Add the cilantro and blend until completely minced. Fantastic! We have cooked sturgeon before but the basic recipe plus this sauce is the best! Puede usar cebolla colorada en lugar de la chalota. Los chiles van licuados entonces los puede licuar enteros (con las semillas) o quitarle las semillas (y cortalas por la mitada) para que no quede demasiado picante. I made this tonight with grilled chicken and avocado. It was delicious! Thank you for posting! I made this last night, over a flank steak, and it was delicious!! I can’t wait to check out the rest of your recipes. Ingrid – I didn’t have a problem with curdling. Maybe because the cream was already simmering?